Drug abuse is a critical problem in today's society and leads to increased rates of crime and homelessness in communities around the world. Red Ribbon Week was established to bring increase awareness and prevention of drug problems among America's youth. Red Ribbon Week wristbands with phrases such as "Say No to Drugs" or "Proud to Be Drug Free" are common to help schools and other organizations celebrate Red Ribbon Week. Drug-free Awareness and Red Ribbon Week bracelets are made of silicone that is flexible, durable, non-allergenic, and comfortable to wear. Best of all, they can be customized with a personal message. At Amazing Wristbands, we make it easy for you to support an anti-drugs cause and Red Ribbon Week in a way that's unique to you. According to www.imdrugfree.com, here are some facts about Red Ribbon Week. Red Ribbon Week is the oldest and largest drug prevention campaign in the country. It usually occurs the last week in October. Red Ribbon Week encourages individuals to take a stand against drugs by making a commitment to drug prevention and education and a personal commitment to live drug free lives. The ultimate goal of Red Ribbon week is the creation of drug free America. Red Ribbon Week commemorates the ultimate sacrifice made by DEA Special Agent Enrique "Kiki" Camarena, who died at the hands of drug traffikers in Mexico while fighting the battle against illegal drugs to keep our country and children safe. Red Ribbon Week is nationally recognized and celebrated, helping to preserve Special Agent Camarena's memory and further the cause for which he gave his life. The Red Ribbon Campaign also became a symbol of support for the DEA's efforts to reduce demand for drugs through prevention and education programs. By wearing a Red Ribbon Week Wristband during the last week in October, Americans demonstrate their opposition to drugs and their commitment to drug prevention. Why Buy Red Ribbon Week Wristbands from Amazing Wristbands? 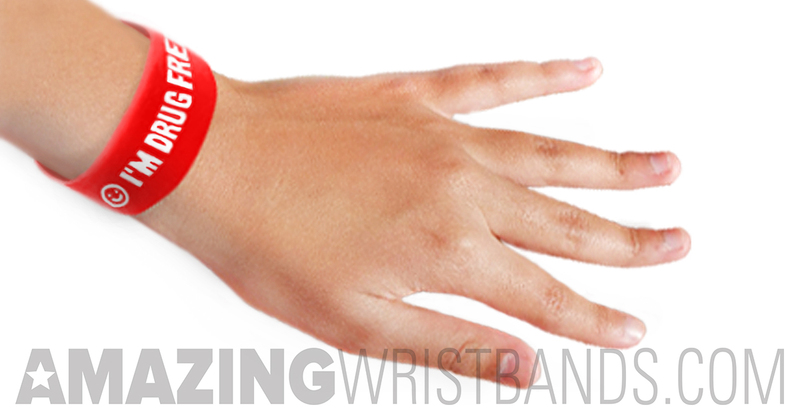 Amazing Wristbands is a leading provider of customized silicone wristbands available online, including Red Ribbon Week bracelets. Our wristbands are comfortable, durable, and non-allergenic. Our professional and friendly customer service agents will help you create your customized drug prevention wristband that will raise awareness of the risks of drug abuse. We offer a wide variety of wristband types to help your Red Ribbon Week wristbands stand out and make a difference. In addition to standard wristbands, AmazingWristbands.com also offers slap bands, adjustable bands, USB bands, silicone rings and silicone keychains. 100% Silicone for your Red Ribbon Week awareness campaign. 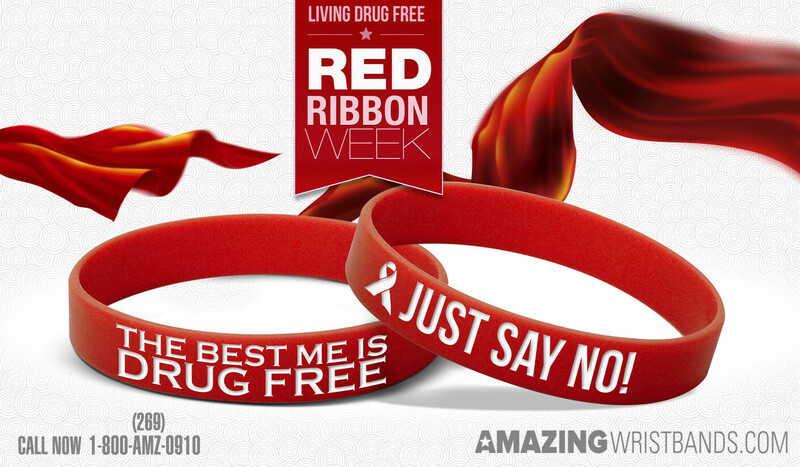 FREE Shipping for drug prevention wristbands in the U.S.
FREE artwork and design for your Red Ribbon Week wristbands. FREE Color Matching – choose red or one of our many other colors! Get a detailed wristbands quote for your Red Ribbon Week wristbands in minutes! I am interested in ordering 250 1/2 inch Red Ribbon wristbands with the saying, "Proud to be Drug-Free" Can you tell me how much and by when would I receive them? Hi Shauna, the sales group responded to your email address but here are the details below: Here is a list of quotes of our different product styles for 700x 1/2" Standard wristbands: 1/2" 700x Screen Printed with your design is $232.67 at a cost of $0.33 per band. 1/2" 700x Deboss with color fill with your design is $265.98 at a cost of $0.38 per band. 1/2" 700x Deboss with your design is $235.39 at a cost of $0.34 per bands. 1/2" 700x Dual Layer Laser Deboss with your design is $292.00at cost $0.42 per band. If you would like to turn this quote into an order, feel free to email us back or call us directly at 1-800-269-0910. I would like to order 700 red ribbon drug free bracelets. Can you give me a quote? I like the smaller bracelet that states proud to be drug free. I am wondering how much it would cost to order 1200 red bracelets for red ribbon week? Thanks. Hello, not sure how to fix that as I'm not aware of that feature on the comments to turn off. When I initially commented I clicked the "Notify me when new comments are added" checkbox and now each time a comment is added I get three e-mails with the same comment. Is there any way you can remove people from that service? Thanks a lot! Hi, We are looking for a inexpensive basic screen printed child size Say No To Drugs wrist bands for 700. Please let me know what your cheapest price would be and could you ship and be delivered asap? Kelly, Thanks for your interest.. We are so happy to make your YOUTH silicone bracelets. Cost will get differ based on the text-style and other options you choose.. So I would need to know a few things to give you an accurate price. 1. Bracelet Type 2. The Message Style 3. Artwork (if needed) Rush delivery is available with us... So you will get your product much faster... For direct guidance from one of our expert designers, please contact 1-800-269-0910 or visit here - Design Wristbands and design your own by following the steps given there... Thank you!!! I'm looking to order 600 YOUTH silicone bracelets. How much is the cost? How fast could I get them? And can I get my own inscription on the bracelets? Hi Serena, We are so happy to see your comment.... Since you are going to order wristbands in bulk, we feel glad to say that there are amazing discount rates available for your order and also rush service available... so please give us a call 1-800-269-0910 (Mon-Fri: 7am-9pm and Sat: 10am-4pm) and one of our sales expert will guide you ... Good Luck!! !